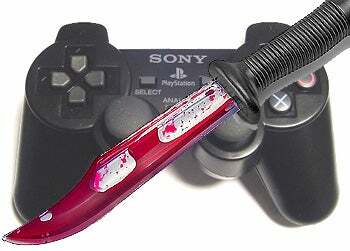 Once again the question of whose turn it is to wield the mighty controller leads to sibling violence, as two brothers in Wisconsin choke and stab each other over a PlayStation 2 game. Police in Waukesha, Wisconsin report that two brothers got into an argument on Sunday over whose turn it was on an unrevealed PlayStation 2 game. The brothers allegedly got into a fist fight, which lead to one brother strangling the other. The one being choked pulled a knife and cut at his assailant's hands, after which the knife changed hands and one stabbed the other in the chest. The stabbing (as opposed to stabbed) brother then fled the scene, walking to the hospital to add frostbitten toes to his list of wounds. That's an awful lot of fuss over a video game. Damn crazy kids, right? The brothers are both in their 30's. Luckily none of the wounds suffered during the incident were life-threatening, so we don't have to feel bad about imagining this same exchange going on between Harry and Lloyd of Dumb and Dumber fame. Police are recommended charges be brought against the brothers. I am recommending a two-player co-op game and an extra controller. The Christmas spirit is alive and well in Wisconsin, ladies and gentlemen.